The collection "colRequest_Products" is used in a combo box control named Items property. This combo box allows multiple selections, and my goal is to have these selected items stored in a Sharepoint List "choice" column with multi-select enabled. 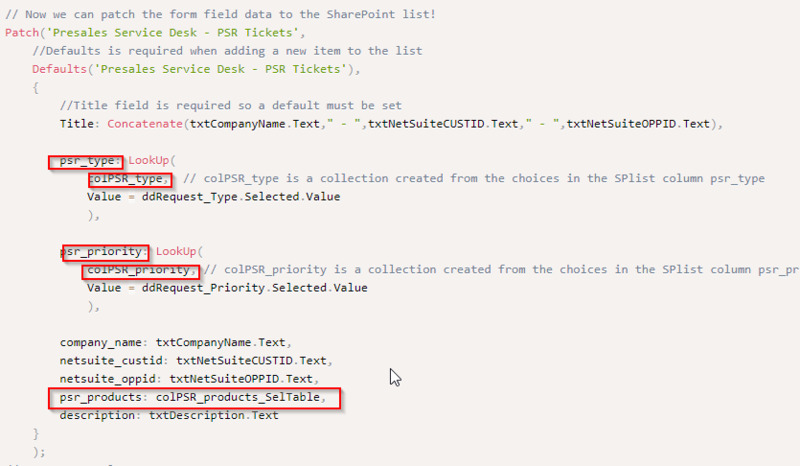 I have the SP list column named "psr_products" and it is set to choice with multi-select enabled. Unfortunately it just doesn't seem to work. If I attempt to patch without the choice column "psr_products" the record gets added to the SP list. once I try to add the choice field "psr_products" and patch, it will not work. Can anybody here help with explaining how to patch a sharepoint list item (create new or edit) where one of the form controls is a combobox and multiple selected items need to be saved in sharepoint list item "Choice" column type with multi-select enabled? enumerator;text value - SharePoint object. collect found objects in the collection, send to SharePoint. I told you it won't be easy :). I'm curious why the Excel file? Couldn't you just use the Choices function? Are values stored in the SP list column's setting? It probably doesn't solve your Patch problem however. Have you tried just a regular EditForm with the SubmitForm function instead? The excel file allows me to let other users easily add new options to the tables. Without giving perms to SharePoint which would only confuse the user community. I allow access to excel file to designated users and they can easily update the table to add options to the drop down list. PowerApps creates a collection from the table. The challenge I need to solve is how to patch to a splist when multiple items have been selected. Ah... Well I would vote against exposing the raw data source period and instead use a screen/form to let users edit/add options. Great idea. I just haven’t become advanced enough in PowerApps to figure it all out. I am thankful communities like this exist. The PowerApp doc is ok. But I think they could provide more depth, and use case examples to help us newbies. Did you try taxonomy/management metadata ? I've know clue what that means. Perhaps in lay terms you could describe that so I understand what you are suggesting. you can create central repository and store values which you expose in dropdowns (multi-select as well). You can grant permissions to the users who can contribute - so they can manage the values. You can share this repository across the site collection. Not only one list. There is a special column type: management metadata, you can connect to your global store. Values from the store would be populated into your dropdown. add one term set and some terms. then go to your list settings and add the column. 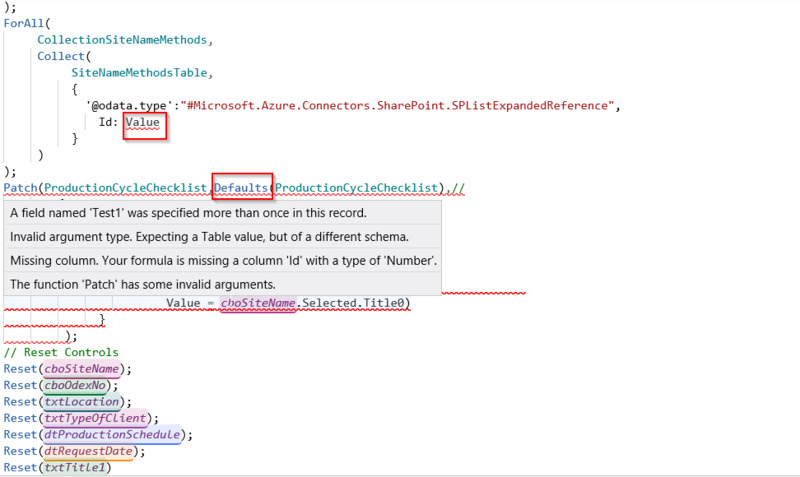 Column type: Managed Metadata, and Point the value to your term store (Term Set Settings - section). If you want some sort of people to be able to manage the values, simply assign them as contributors in term store settings. I hope I gave you some spotlight. If you need more details, feel free to contact me. ​Hi - same as what the other folks have said - SharePoint choice columns are fiddly and SharePoint will be looking to match the value you patch - you cant just submit a random value into one - it has to already exist to match. Better to either make the sharepoint column just text - as you are already controlling what people can choose to select from the excel file right? If that's no good - then create a new sharepoint list to house your datasource of choices - you can even put row level security on each list item, then in the list add your sharepoint list you are patching to add this column as a look up - the id's will be respected and you will be able to patch new items against any id values that exist in the look up. Yes, I agree Choice columns are fiddly. I did have the Choice column set up with all of the choices that the excel table had, and I enabled the option to allow adding new entries. However, that being said. I agree that the easier approach would be to control this all within PowerApp itself, and have the SPList Column be configure as a text field. ​Seems like it would be easier to patch to a text field, but I need to figure out how to get the selected values of the combo box sent to SPList as a string: item1; item2; item3 etc. You didn't try taxomy. Did you? From my personal experience, I would avoid taxonomies if you are newbie and/or you want users to be able to add/update the combo box values. If patch() is the issue for you, have you tried SubmitForm instead? That is the case. With taxonomy users can modify values and they don't need to be a member of site admin or owners. Thank you for the reply. Yes I have tested with SubmitForm() and I am able to get multiple values selected in the combobox written to the SPList column. I was shying away from using a Form as I thought it was too restrictive on layout. I will revise that thought, and try again. Thank you and everyone else for your help and replies! I'm circling back on this to update everyone that I finally found the answer I needed. :) While there were some diversions along the way with discussions about Taxonomies/Metadata, and why use Excel? for my drop down or combo box choices. The real need was figuring out the syntax for the patch(). Finally....I found the solution in a tutorial that Audrie Gordon published on Oct-28-2018. Audrie covers several other cool ideas in this tutorial, but the part that was most interesting to me is how she used the patch(() function to create a new SPList item where there were both combobox controls where a user would select multiple items, and also drop down controls with only a single choice chosen. This tutorial is genuine GOLD. The rubber meets the road for me starting at about 29:30 where Audrie dives into the patch syntax. Using Patch() is preferred for me over a SubmitForm for an editForm because you get far more flexibility for laying out your controls when not constrained to a column based form layout. Reuse Forms/Galleries for multiple SharePoint lists! For reference, here is the 'OnSelect' formula for my Submit Button, based on the guidance provided in Audrie's video. I hope others find it useful. // The patching is a bit complex due to the use of a combobox with ability for the user to select multiple items. // Next we need to create another collection to be used as a table for patching. // Now we can patch the form field data to the SharePoint list! Any help welcome . Am stuck with updating a SharePoint list from a combo box. It just wont update . The column in the list ,used as a lookup is SiteNameTest . That is linked to a Combo box cboSite Name. What i want is to save the selected value or values specified in the combo box back to the SharePoint List. Have been at this for 2 days straight with no luck .Please advise where i am losing the plot. I suggest changing that, and see if that helps. Also in your Patch() section I do not see a Defaults statement. I found this very helpful, and the patch section starts at about 29:30. Worth viewing if you have not seen it yet. Thanks for your prompt response and assistance . I just have a few little questions on your example .That might guide me to get my soln working. Challenge on mine is "Value" doesn't resolve. Not sure if i am missing a reference .Default is already added. You mentioned a combo dropdown but its not mentioned anywhere in your code . Did you end up using a normal dropdown and forgo the multi selection? The collections in the boxes below are not set in your code . Are they variables or they are collections created on the fly ? Are the values on the left all Columns in your SharePoint List ?